The shooting community has been patiently waiting for more information about the Labradar doppler radar chronograph. It is finally shipping on a limited basis for around $600 with accessories. Serial Number 0006 was delivered to RSI in November, 2015 and we have been testing it extensively. This review attempts to provide information that has not been published elsewhere. Shooters now have so many chronograph choices it is more than a bit confusing. Technologies range from proven 40 year old optical light trap systems, to newer acoustic, electromagnetic and now even doppler radar with prices from $55 to $800. Most reviews say each is the best or report they "do the job" for less! How can that be with a 1400% price differential? For the purposes of this review I am limiting discussion to only products manufactured for the civilian shooter. Let's start with some historic perspective. I bought my first chronograph in the 1960's while in high school. It was an old Herter's screen system. People who have never seen the old Herter's would laugh. You would shoot through two squares of metal window screen. Analog circuits would light a matrix of light bulbs inside a big ugly sheet-metal box and you would decipher the velocity from a printed sheet glued inside the cover. Because it was simply measuring time, we all got stuck with the term "Chronograph" and what is called the "Screens" on today's chronographs were literally squares of metal window screen. The numbers it provided was barely better than none at all. It missed shots and shooting through the screens disrupted the bullet path to the target. In the late 70's Oehler introduced their first optical chronograph (timer tripped by the bullet shadow), it was truly revolutionary and instantly replaced all the old systems. It had a tiny red single-line digital display (like the first HP pocket calculators) which showed velocity for each shot and the calculated Average, S.D., E.S., etc. for the string. How cool! It even had TWO push buttons to delete shots or toggle through the summary data. Slow circuits of the day limited precision so screens had to be 10 feet apart in order to reliably capture velocities to single digit deviation . . . BUT IT WORKED and truly revolutionized the process of load development. For the first time shooters could capture accurate velocities WITHOUT altering the point of impact. Over the next 20 years more companies entered the chronograph market with similar optical systems. Not much happened to improve the basic technology other than clock speeds increased so a 10 ft. screen spacing was no longer required. Initial brand differences tended to involve convenience of setup, size and transportability. Some "all in one box" designs were intended primarily for IPSC handgun shooters, others with wires to the sensors from a control box were for riflemen shooting at a bench. They were all optical light trap systems with simple chipsets, photoelectric cells and a crystal oscillator clock. By 1999. when the first Chronographsograph was introduced, older optical systems were beginning to show their age. High-end models were printing to adding machine tape rather than saving data to memory. A few had RS-232 PC connectivity but memory and software was limited and artificial lighting consisted of appliance light bulbs in a metal box. The CED was the first to catch up to PC technology with fast surface mounted fully integrated digital circuits (ASIC), none-volatile memory to store data, a large custom LCD display, multi-function keyboard and a true Infrared lighting option so it would work in pitch dark without AC power. As technically advanced and feature rich as the original CED product was, it was certainly not as revolutionary as the first Oehler and years passed before it finally gained acceptance in a cluttered market. The CED M2 is now the official tournament chronograph for SASS, IPSC and IDPA. All optical systems suffer from the same maladies, especially when not equipped with artificial illumination. Too much or too little light, light from odd angles shining on the optics, etc. can produce missed shots and errors. While the CED equipped with Infrared lighting eliminates most of these problems, it is still NOT entirely fool proof. Two new chronographs promised to eliminate ALL lighting problems with use of acoustic or magnetic sensors. That they do, but the alternative technology introduced other issues and limitations. Like the optical systems, both measure the time a bullet takes to travel a short span, just with a different way of detecting the passing bullet. 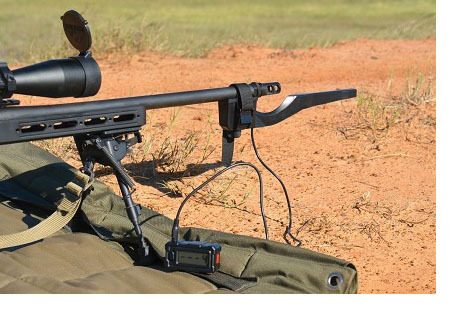 Magnetospeed uses closely spaced magnetic start/stop sensors embedded in a short plastic device that is clamped directly to a rifle muzzle. This solves a big problem for those who are denied access to the front of the firing line at public ranges and since it does not require light, it will work under any light condition without artificial illumination. Magnetospeed is one of the easiest chronographs to use but the system can't be mounted on most auto loader handguns or arms where the device can't be positioned 1/4 inch under the bore. There are also sensitivity settings that may need to be changed or it can still miss shots and it must be remounted/moved to each firearm if more than one is used at the range. Perhaps Magnetospeed's greatest limitation is the additional weight hanging on a barrel can significantly alter group size and the point of impact. I have seen groups double in size and move 6 MOA when Magnetospeed is attached to the muzzle of a long thin hunting rifle barrel. For rifle shooters who know how to develop hand loads while shooting over a chronograph, this alone is a deal killer. And, for those attempting to load to single digit standard deviations, the short distance between start and stop sensors without a proportionately faster clock speed, limits it's precision . (See following velocity data.) Once could argue while for it's narrow intended purpose the Magnetospeed works well, because it alters the P.O.I. like the old Herter's, it is a step backward for serious handloaders. So today with far more brands and technologies than the market should be able to support, ranging in price from $55 to $800, the decision about what to buy is even tougher. And all of them do work with varying degree of precision, problems and features. Where does Labradar fit within this cluttered market of shooting chronographs? Will it have the impact of the first Oehler and replace optical, magnetic and acoustic chronograph technology? Will it do something less expensive chronographs will not? Is it a good value for most shooters? Here are links to other Labradar reviews and it's operators manual. First, what Labradar is not. Labradar is not like commercial doppler radar at military ranges capable of capturing bullet velocity and the XYZ coordinates to long ranges. Products sold to the civilian market are subject to FCC regulation which limits transmissions and therefore the sensitivity and range of any radar we civilians are allowed to own. FCC compliant radars available to capture the speed of a baseball pitch or golf /tennis balls were just not powerful or sensitive enough to use for shooting. That has finally changed thanks to some brilliant engineering by Infinition Inc of Trois-Rivieres, Quebec, Canada. Labradar is the first FCC compliant and "affordable" civilian doppler radar with enough sensitivity to capture bullet velocities. Infinition has been a leader in Doppler Radar Technology since 1996 with commercial radar installations around the world. Unlike optical or electromagnetic systems, Labradar does not capture velocities by determining the time it takes the bullet to transit between start/stop sensors separated by a fixed distance. Instead it uses an acoustic microphone to establish the start time of a shot then extrapolates the velocity backward to the muzzle from doppler returns reflected off the base of the bullet. The radar pulses continually so reflections are at random ranges for each shot, beginning at 15 to 25 yards when the bullet passes from the side into the doppler beam. Returns may be separated by a foot to 1 yard intervals depending on the velocity. 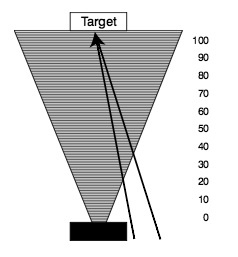 Labradar may detect the reflection from larger based projectiles to 100+ yards while returns from small bore projectiles (with smaller base) may only be detected to 40 yards. This is an important difference from all other technologies. Unlike technologies where you know the measured velocity is near the mid-point between the sensors; with Labradar, many readings are processed via elaborate firmware to "predict" the muzzle velocity. When I first saw how it worked, I was more than just a bit skeptical. To test Labradar's precision I waited for a perfect overcast day so I could place a CED M2 sensors in front of Labradar without tops so the CED M2 might not interfere with the radar. The CED M2 has proven to be a precise chronograph with the highest clock speed of any optical chronograph, but because it was located in front of Labradar; I knew the numbers would not match. I was primarily interested in the deviation and spread numbers which should be close if Labradar has precision approaching that of a good optical chronograph. No Hype, for getting muzzle velocities, Labradar works as advertised! The ammo was flat based 6mm 70 gr. and 100 gr. bullets shot from a Remington 700. Neither Labradar or the CED M2 missed a shot despite the high velocity of the 70gr bullet. Most importantly the deviation and extreme spreads were quite close so our first big question was answered. Labradar can definitely be used for rifle load development. Unlike Magnetospeed, Labradar does not change the point of impact or group size so loads can be developed as they would with a conventional optical chronograph. ALL FROM BEHIND THE MUZZLE. Similar results were produced for .22, .308 and 50 cal rifle bullets between 2,500 and 3,500 fps. It also had no issues getting muzzle velocities for handgun calibers from .380 to 500 SW. I could not fully account for the 25+ fps higher velocities from Labradar. Perhaps 5 fps could be explained over the 8 ft. distance to the CED and another few fps may be from backset to the muzzle for Labradar, but it looked as if Labradar was reading higher or the CED was reading low. Even though no skyscreens were on the CED and I thought the CED sensors were low enough to clear the doppler pulses, they may have interfered with Labradar. I then included Magnetospeed in the mix and tried a different method to get all three technologies working at the same time. I shot 7.62 M80 ammo from an M40 with the CED turned sideways using a large white sheet of Plexiglas as the diffuser. Everything was carefully located so nothing would interfere with the the 7 degree wide Labradar doppler beam and shots were perfectly parallel to the CED sensor rail. The retest again confirmed Labradar closely matches the precision of a good optical chronograph. The difference between the CED M2 and Labradar is easily explained by the CED's distance from the muzzle and Labradar's slight backset. For these 7 and 6 shot strings (relatively small samples), Magnetospeed was the out lier with higher shot to shot deviation and inconsistent velocity. This would indicate Labradar may have better accuracy than Magnetospeed. For those not familiar with the BM59 (Beretta Modification 1959) M1 Garrand it is equpped with a muzzle brake. The Rem M40 and 700 above did not have a muzzle brake. Could that explain the Magnetospeed velocity difference? I then tested just Labradar and Magnetospeed to see if Labradar was somehow affected by the CED within the doppler beam. As should be expected, if you shoot a sufficiently large number of shots (increase the sample size), summary calculations begin to tighten. The concensus has been that Magnetospeed should compare well with good optical chronographs. Since I could not rule out the possibility of interference from Labradar, more testing with just the CED M2 (using conventional skyscreens 10 ft. from muzzle) and Magnetospeed was needed. These results were indeed surprising. For some reason the CED M2 consistently produced higher velocity this time. These statistics are far from conclusive and should not be used to proclaim one chronograph is better than another. Hand loaders should primarily be interested in small sample precision and everything would indicate the CED M2, Magnetospeed and Labradar are competitive in this regard. To determine which brand is more accurate, they would need to be compared to commercial D.O.D doppler. 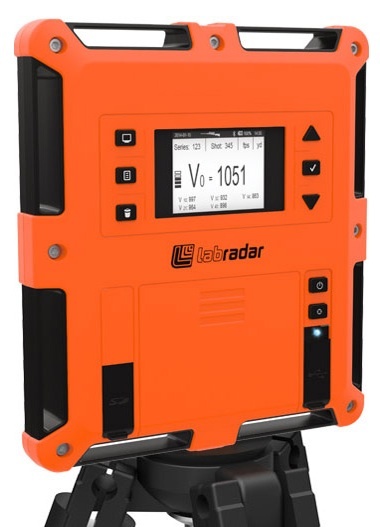 In the US and CA where higher power radar transmissions are allowed, Labradar can capture velocities to 100+ yards. Is it then possible to calculate Ballistic Coefficients using Labradar data? In other countries where power is restricted, Labradar will only capture sufficient data to provide a good muzzle velocity. And, it is obvious from our experimentation as well as Labradar's web site, that 100 yard data will only be possible for larger bore calibers. It seems the "magic" bullet dimension requires a base larger than 6mm but that should include most bullets used to long ranges. 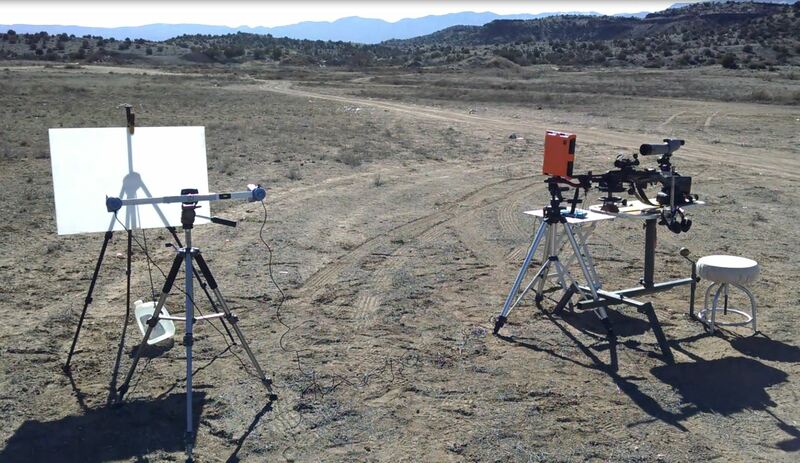 I next attempted to get good downrange velocities for round ball and M80 ammunition. Round ball because a GS drag B.C. can be calculated from the ball diameter and M80 because it has a well accepted G7 B.C. of around .200, possibly a little higher to .209 for steel jacketed bullets and old BRL spark range data for copper jacketed M80 produced a G7 B.C. of .198. I quickly discovered a percussion cap muzzle loader did not work with Labradar. Apparently the double "KaPow" of a traditional smoke pole confused the acoustic sensor. It would pick up every shot from a modern in-line muzzle loader but lacking a flat base to reflect doppler, I could not get data to long range. Round balls are just too "stealthy" to get much down range data. And yes, to any smoke pole shooters, I did try both saboted, patched and unpatched balls to no avail. I purchased their optional air gun microphone but have not yet revisited to the test to see if that resolves the issue. The first test using a friends Styer Scout was too good to be true and produced a perfect .200 B.C. with a "guess" at air density from my cell phone barometer and the local weather underground station. The summarized data and B.C. 's were generated from some experimental code soon to be added to the RSI Shooting Lab. Wow! Showed great promise. No. Vel. fps 20 Yds 40 Yds 60 Yds 80 Yds 100 Yds Loss B.C. I was never again able to capture 3 out of 4 shots to 100 yards. At two different locations with three different rifles, Labradar would collect 100 yard data for M80 ammo roughly once out of every three shots. With more experimentation I may be able to determine if down range brush was the problem at one location. Most importantly, with carefully recorded air density, the calculated G7 B.C. 's were closer to what was expected for steel jacketed M80 bullets. Like all chronograph technologies, Labradar also has issues and limitations. It can still miss shots if not mounted on a good tripod or configured correctly and can be affected by ground clutter, positioning, etc. I quickly learned how to capture good muzzle velocities for everything tried. 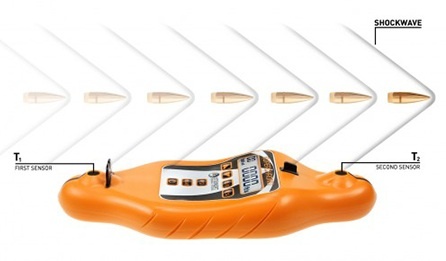 Due to it's amazing technology and potential, it is a welcome addition to our range tools. I am still learning all it's features but after just 6 sessions have fully transitioned from skeptic to fan and intend on keeping my Labradar. Optical chronographs will always be more affordable. They simply cost less to produce, especially those that are "feature poor" with no investment in embedded firmware. In my opinion many of the problems associated with optical chronographs are overstated or are just more problematic with some brands. I rarely have issues with the CED M2 when equipped with the optional IR lighting option. It is our opinion the CED M2 chronograph will continue to be the best general -use value for shooters. It is accurate, will work with any caliber or arm and will not change the point of impact. It's large display can still be used to get down range velocities and when equipped with the optional IR Lighting option, a CED will also work in pitch dark. If you need a good chronograph for use with handguns or .17's to 50 cals, and cannot justify Labradar's $600, or Magnetospeed's $400, you can't go wrong with the CED M2. Labradar's level of sophistication is way beyond anything else available to shooters but may not be for every one. Those who are short of patience and only shoot factory ammo from a "bullet hose" rifle will be well served by Magnetospeed. Those who load for accuracy and shoot many kinds of weapons should prefer either a good optical chronograph or the new Labradar. Which to buy may depend on how deep your pockets are, if you reload and how much you like data. I have no problem recommending Labradar over other higher priced systems. With some time at the range, Labradar is just as easy to use as Magnetospeed and will work with more firearms. 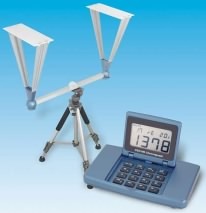 Unlike Magnetospeed, once set up next to the bench and pointed to the target, just turn it on to capture data. There is nothing to move when switching firearms; and best of all, you can collect LOTS of data while working up loads because it does not affect the bullet's point of impact. It's S.D. card memory is unlimited and every shot including the doppler track data is stored automatically. It is a data collector's dream.! There are those who say Labradar cannot be used to calculate B.C. 's, the above data should make them think again. They are probably vested in the idea that "G7 drag fits all rifle bullets" which I have long argued is not correct. The next installment of this review will "hopefully" demonstrate further that Labradar can indeed be used to calculate B.C. 's sufficient to "get on paper" at 1,000 yards. A heavy and solid tripod is necessary with Labradar to get down range data. Anything that moves down range can affect readings. The beam is at least 7 degrees or 35 ft wide at 100 yards. As you can see from the above pictures, here in AZ, the ranges are typically clear of vegetation so you may need to do some brush pruning on your range. My list of complaints about Labradar is short. Many of the issues I discovered may be resolved with a firmware update. Slow USB - It seems Labradar does not have full USB support for S.D. cards in it's firmware. When plugged directly into a PC via the USB port, access to the S.D. card is painfully slow. This is a minor issue because removal of the card and insertion into a USB card reader provides fast direct access. The nearly completed tools being added to Shooting Lab will import data from the card and provide options for saving it to the PC hard drive. LCD Display - Outdoor light is bright in the desert. While the extrapolated muzzle velocity is beautifully large, it is nearly impossible to determine if a 100 yard velocity has been captured while shooting outdoors in bright light. I understand the large display contains allot of information and not all of it can be big, but wish the down range velocities were a darker font. I will be experimenting with various shading methods. Uses Power - I was actually amazed at how power efficient Labradar is. A single set of batteries will last a couple sessions. That is amazing since it is transmitting down range, writing massive amounts of data to the S.D. card for every shot and powering a large display. But those used to running an optical chronograph for hundreds of hours on a single 9 volt will have to manage power. Infinition was smart enough to include a standard micro USB connector where you can plug in a rechargeable external power supply as used to recharge your cell phone. Aiming - Labradar must be critically aimed for down range data retrieval. The small notch on the top is not adequate and I wish they had molded a hole through the housing. I will be adding some sort of aiming aid. Housing & Mount - A small brass 1/4 inch ferrule in the base of Labradar is the only point to mount it on something. There is sufficient flex around the ferrule to allow it to move from muzzle blast which inhibits ability to capture down range data. The buttons require quite a bit of force to operate and the unit moves all over on it's mount with normal operation. I will be fabricating some sort of mounting frame to hold Labradar. The Labradar factory prone plate is also too flimsy and does not provide adequate support.